A plump little ram is just waiting to snuggle into your wooly creations! 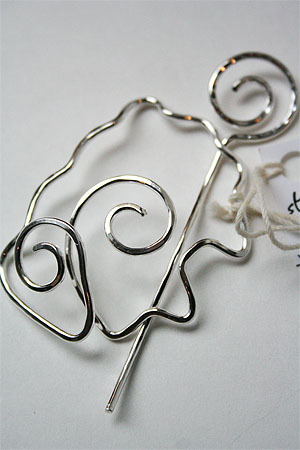 This shawl pin is very very light, but incredibly sturdy, with no sharp edges to snag or pull. The stick is curved so that it stays put when fixed in place (pat. pending). Body of pin is approx. 2 in. in width. Pins are hand formed and will vary slightly in appearance. Romi Designs handcrafted Shawl Pins and Decorative Stickpins are just that extra touch - lovingly handcrafted by Romi in sterling, Sterling, and nickel - make beautiful presents and special thank you's, too.